Don’t leave sump pump installation to less than reputable plumbers – it could cost you thousands in damage. If you have a sump pump at home, chances are you know how finicky these machines can be. They sometimes seem prone to failure at the most inopportune times! And yet, sump pumps are the last lines of defense from potentially thousands of dollars of water damage to your home. Proper maintenance of your sump pump is one way to prevent failure and headaches. 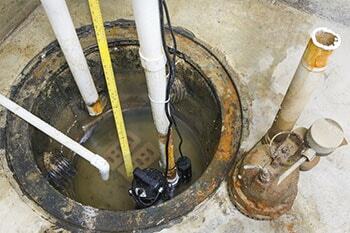 Here are some other reasons why your sump pump could fail. Sump pumps need electricity to run… which is why they tend to turn into useless hunks of metal and plastic when the power goes out during a thunderstorm. You can prevent this problem by installing a backup generator – your sump pump will continue to help protect your home. Your sump pump needs to be in the “Goldilocks” zone – neither too small, nor too big. If it’s too big, the pump ends up working harder which shortens its lifespan. But if it’s too small, the pump can’t keep up with the amount of water it needs to process. Your sump pump installation should not be handled by amateurs or less than reputable plumbers. Pumps must be installed correctly and exactly to manufacturer specifications in order to run well and protect your home from damage. It is highly advised to contact a professional plumber with a good reputation for pump installation. When the pump shifts positions in the basin, the float becomes ineffective. This causes problems for the on/off switch of the sump pump system. An important component of the sump pump system is the line which directs water from your home to the outside. If this line is blocked off, either through freezing or clogging, it can cause your system to fail. While rare, you might be in the possession of a defective sump pump. The best way to protect against this is to make sure the system is tested thoroughly after installation. This entry was posted on Friday, September 16th, 2016 at 6:05 pm. Both comments and pings are currently closed.